For more than 40 years, IBM® mainframes have supported an extraordinary portion of the world’s computing work, providing centralized corporate databases and mission-critical enterprise-wide applications. The IBM System z® provides world class and state-of-the-art support for the TCP/IP Internet protocol suite. The convergence of IBM mainframe capabilities with Internet technology, connectivity, and standards (particularly TCP/IP) is changing the face of information technology dramatically and is driving requirements for even more secure, scalable, and highly available mainframe TCP/IP implementations. The z/OS® Communications Server TCP/IP Implementation series of IBM Redbooks® publications provide understandable, step-by-step guidance about how to enable the most commonly used and important functions of z/OS Communications Server TCP/IP. 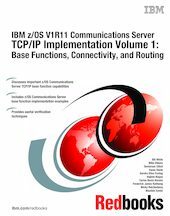 This IBM Redbooks publication provides an introduction to z/OS Communications Server TCP/IP and discusses the system resolver. It also presents implementation scenarios for TCP/IP Base functions, Connectivity, Routing, Virtual MAC support, and sysplex subplexing. For more specific information about z/OS Communications Server standard applications, high availability, and security, refer to the other volumes in the series.